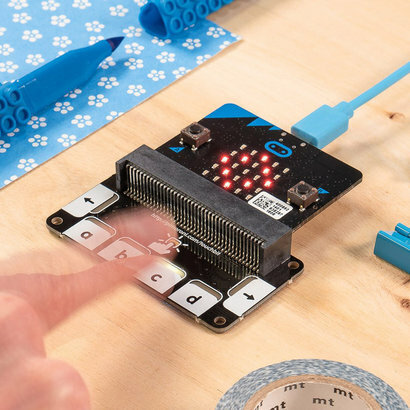 The Pimoroni touch:bit features six handy touch-sensitive buttons and LEDs for your microbit. Use touch:bit as a controller for games on micro:bit's LED matrix, or combine it with the radio functionality and use it as a controller for your robot. Just slot in your micro:bit, then code touch:bit with the block-based Microsoft MakeCode editor. You can easily link functions to specific button presses, have the LEDs on each button light automatically on a touch, or set the LEDs manually. Pimoroni have created a set of custom blocks in the Microsoft MakeCode Editor for the touch:bit. To add them to the editor; select the cog in the top right of the editor, then select 'Extensions' from the drop down menu. Now, type end enter Pimoroni into the search bar and select the touch:bit tile. You will now have access to the 6 custom blocks that you can use in your code. The touch:bit does not include a micro:bit. The micro:bit is available separately. CAP1166 capacitive touch and LED driver. 1 x touch:bit for BBC micro:bit.